Some riders want to tame the trail. But for those who want to dominate it, ZR Limited adds an easily adjustable suspension calibration to our legendary ZR. FOX ZERO IQS SHOCKS: No matter your riding style — or what the day brings — FOX ZERO iQS shocks will be ready. Featuring three compression settings (Soft, Medium and Firm) that can be easily adjusted with a dial mounted on the remote reservoir, FOX ZERO iQS shocks are built for changing terrain. Their remote reservoir delivers fade-free runs, while coil-over springs even out the bumpiest rides. Available in 1.5 inch diameters. 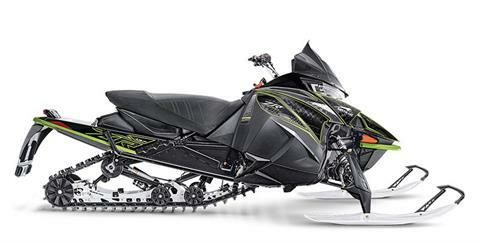 6000 SERIES C-TEC2 ENGINE: The first clean technology Arctic Cat 2-stroke engine, the 6000-Series 599cc C-TEC2 with Dual-Stage Injection (DSI) leads the 125-hp class in performance. It features batteryless EFI; electric oil pump; APV electronic exhaust valves; Exhaust Pipe Temperature Sensor (EPTS); knock sensor; and engine reverse technology. It’s exceedingly robust and lightweight. GOGGLE HOLDER: Mounted right in the dash for quick access, this integrated goggle holder keeps a key piece of gear safe and sound. 11" MID-HEIGHT WINDSHIELD: Added protection from the wind lets you enjoy more of the ride.